I love the landscape cards with the silhouette stamps. The problem is my brayering is horrible. Ive tried both the speedball and the Ranger, and I still have problems getting blending to look seamless. I'd seen the Inkylicious Ink Dusters at several shows, and finally picked some up at the Great British Craft Show a few weeks ago. Having two babies it's taken a while to get some free time to have a play, but now I have I wish id got these brushes sooner. Ink Dusters are double ended brushes, made from a blend of three types of natural fibres. They don't transfer colour (within reason), so you can keep a single brush for multiple shades of one colour, e.g. all blues can be done with a single brush, so can all greens etc, which means you don't need hundreds of them and you don't need to keep washing them out. The Ink Dusters come with a lot of loose hairs. The instructions tell you this and tell you to give the brushed a good shake and brushing against something to get the out. I did this but did find I was still having hairs falling out right to the end. 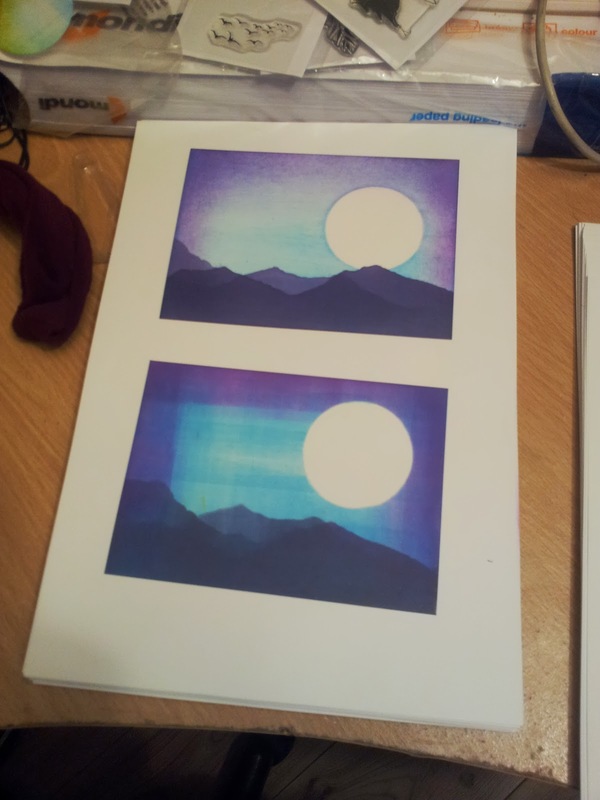 The top image is done with the ink duster, the bottom with the brayer, both onto matt art card. The basic background is Adirondack Sailboat Blue. 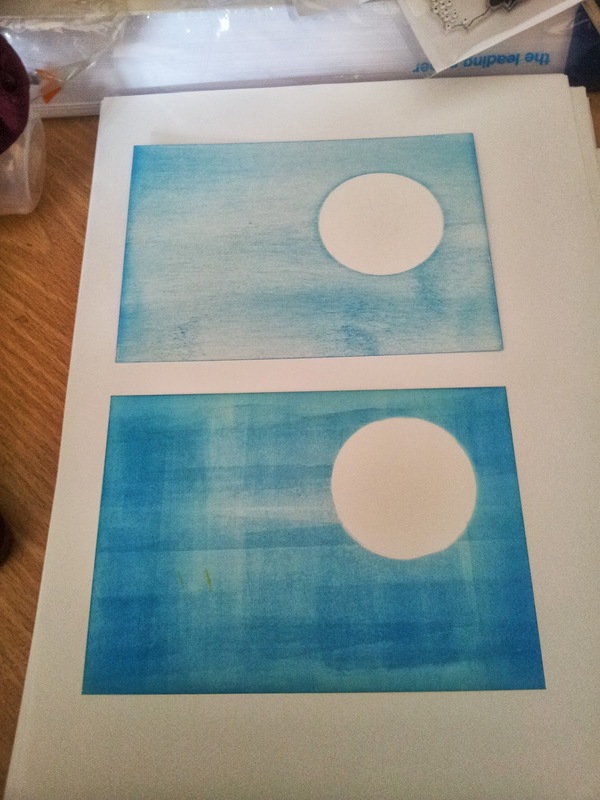 The brayer gives a much deeper brighter colour, and rolls over the mask for the moon much more smoothly, leaving less of a halo, but look at the streaks. I still haven't got the hang of it. The ink dusters went on more smoothly, but it was still quite streaky. The bristles caught the mask quite considerably, leaving it with a rather pronounced halo. The instructions say to use the side of the brush and brush back and forth, but as I'm used to using the Ranger Blending Tool, I kept getting and urge to move in a circular buffing movement. I quite deliberately left out the second stage of background, as I wanted to test going back and doing stuff later, so I moved straight to adding some mountains. I used Eggplant Adirondack, and again the duster is on top, and the brayer version below. This is where I found the ink dusters much easier than the brayer. The mountains blended much better and it looks much smoother. I did end up using more of a burnishing stroke than brushing, and it does look incredibly smooth. One thing I find with the brayer is that if I'm trying to blend over something that has thoroughly dried it looks really awful. I wanted to see if the Ink Dusters were any better. The answer: yes! 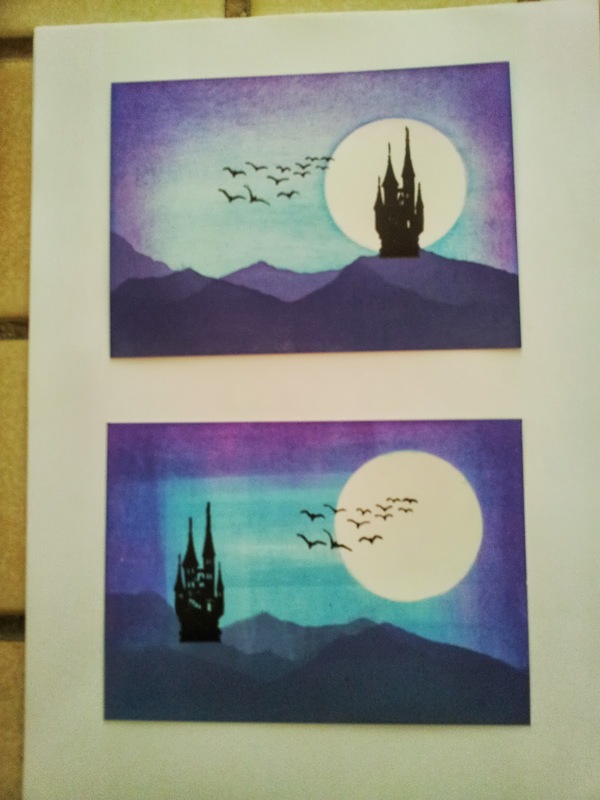 Adding Purple Twilight to deepen the backgound at the edges (something I normally do after the main background). The ink duster version, on top, is so much subtler. The Brayer version has really harsh lines. This is where having most of my stamping kit packed up really hurt. I only had a few new stamps to hand, and no acrylic blocks to mount them on. I improvised with a CD case, but it wasn't ideal. I actually prefer the lower version, the brayered one. The intensity of colour a brayer provides really made the black look extra bright and really pops. I may feel like this because the stamping on the ink duster version is slightly smudged and not perfect. So far, Ink Dusters 3, Brayer 1. But there is another reason why I think I'm going to prefer the Ink Dusters. I find them more meditative. With a brayer there's the constant click-click of inking up the roller, and then pulling it across the page. With the Duster, you can just quietly buff the colour into the card. Its almost zen. 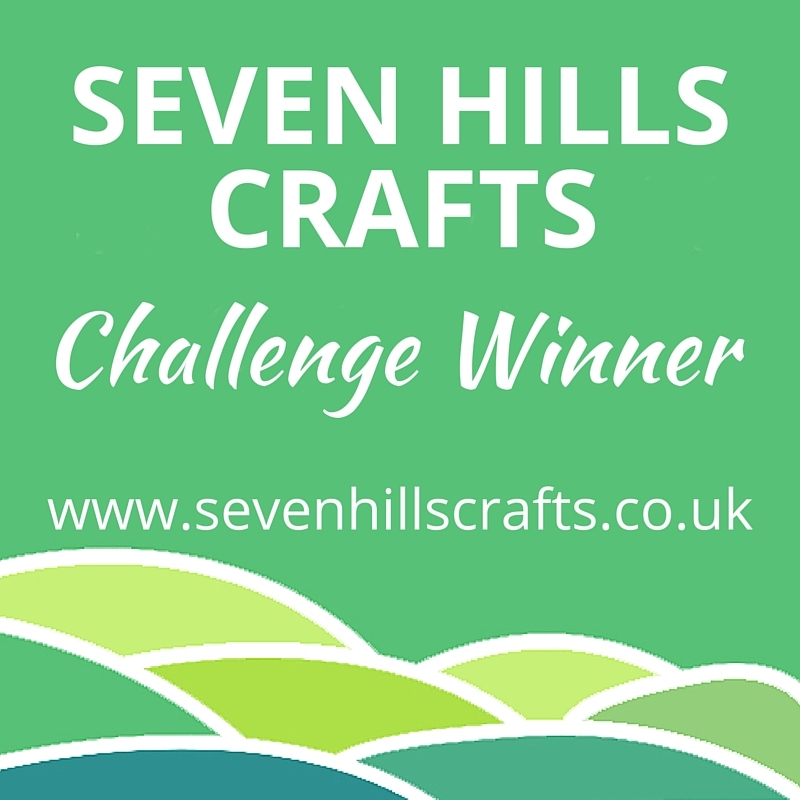 I'm crafting to find calmness and clarity in m life. The noise of the brayer is just irritating. 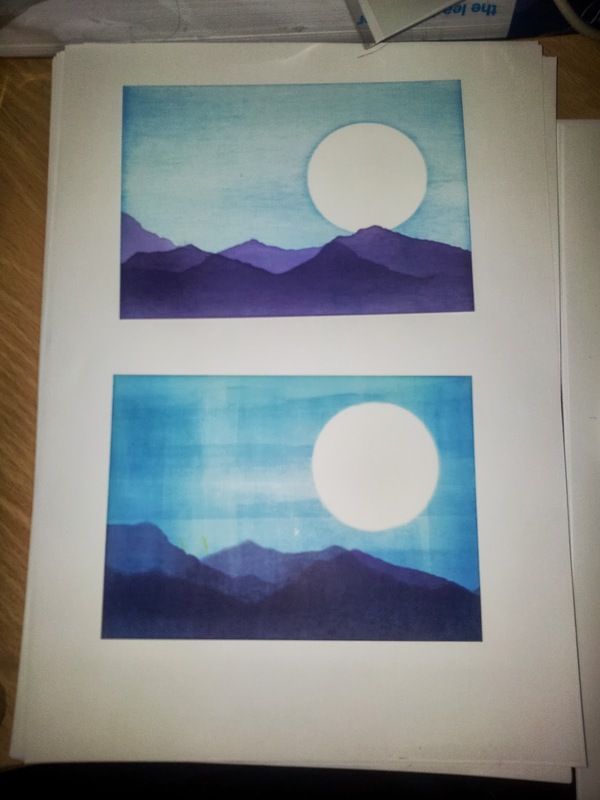 But I don't think I'm going to drop the brayer completely for this type of creation. Its so much better at lighter colours, and gets an intensity of colour quicker. Whilst I'm going to keep on with the ink dusters, I'm also going to try and get my brayering sorted out. It will be so much better when I don't have time to lay down layers and layers and layers of light colours with the ink dusters.